“Willing to Listen” Featured Twice on NBC 5 News in Chicago! Chicago, Illinois (May 1, 2013) – Everyone is talking…texts, tweets and e-mails are flying, but is anyone really listening? Nationally recognized meditation teacher, Elesa Commerse, believes listening is becoming a lost art and she’s doing something about it. In celebration of National Meditation Month, Chicagoland residents are invited to experience the healing power of being heard deeply. Commerse has established free listening stations throughout Chicagoland and trained 50 volunteers in the art of deep listening. Deep listening is not a substitute for counseling and has its own benefits, according to Commerse. 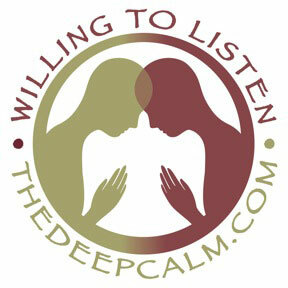 The deep listener’s sole purpose is to listen with mindfulness and compassion. Listening mindfully means that your mind is full of the moment, as if your life depended on it. That’s a very active, engaged, sharp form of listening. The deep listener passes no judgment; offers no commentary, feedback, suggestions or answers. The listener doesn’t interrupt, try to complete sentences or help the talker find words during pauses. Throughout the month of May, following morning classes, volunteers will be available for 5 -15 minute listening sessions at: Touching Earth Mindfulness Learning Center, 1932 Half Day Road, in Highland Park, Illinois; from May 1-7, from 12:30 -1:30 PM at Infuse Yoga Spa, 713 W. Wrightwood, in Chicago’s Lincoln Park; and from 12:00 – 2:00 PM, May 13-17 at Tejas Yoga, 1300 S. Wabash Avenue, in Chicago’s south loop. © 2019 The Deep Calm. All Rights Reserved.